The METCALF is an all-around workhorse, enough volume for more than a week in the field but compressible enough for an afternoon stalk. Built onto our Guide Light Frame, the METCALF has ample heavy-weight capacity, and the OVERLOAD feature keeps bag contents clean when packing out a carcass. With a detachable lid, side detail pocket, and full-length side zip access, this pack is a favorite among hunters looking for versatility and all-around utility. The Guide Light Frame is a rigid yet dynamic frame system that moves with you. With lightweight carbon fiber stays that flex with your body to comfortably carry heavy loads, it also features heavy-duty compression straps and load lifters to stabilize the load. It also features a Redirect waist belt system that secures in a natural, forward pull direction that requires less effort to tighten and with patented features and construction methods, the waist belt cants and conforms over the hips to effectively transfer and distribute the weight eliminating slippage down over the hips. 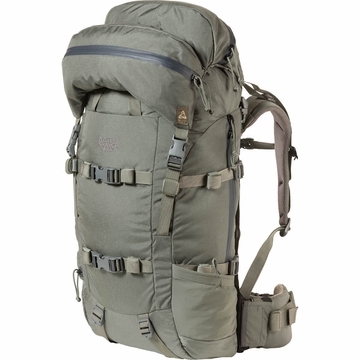 OVERLOAD feature provides functional expandability via a load sling between the pack and the frame, allowing you to put the bulk of the weight closest to your back for optimal comfort. The patented Futura Yoke easily macro adjusts to the torso length allowing the proper amount of stand-off between the back and frame.